These salt dough ornaments are fun and easy for kids or adults. We used teeny tiny cookie cutters to make little ornaments, but you could make larger ornaments as well. Use a mixer to combine all ingredients until you have a sticky dough, making sure all of the flour is mixed in well. Kneed the dough on a well floured surface until you have a pliable dough, about 10 minutes. You may want to wear gloves because the dough can be drying on your hands. 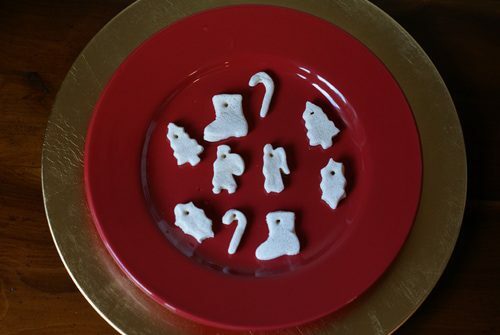 Roll out the dough to 1/4″ thickness and use cookie cutters to cut out your shapes. Use a toothpick to add a hole at the top of each ornament. You will have to work quickly with the dough, keeping any extra wrapped in plastic wrap, because it dries out fairly quickly. Add glitter to your dough for sparkly ornaments. Be careful not to add too much since they might not dry properly if the ratios are off. Press beads and other embellishments into your shapes before drying them. Once dry, paint your ornaments with regular paint or glitter paint.